I’m a big fan of Zorro. That’s not normally a reason to buy a wine. It’s never a good reason to buy a bottle of wine, but just look at the label on this one. It not only has the “mark of Zorro” on the label, but the Z is back to front so it must have been slashed into place by Zorro actually inside the bottle. All you have to do is open the bottle to unleash the Zorro inside. OK, so that may not be an actual fact. The Z is the wrong way round which I assume is a style or branding decision, and the accents on carmenere are the wrong way round too, which I have to assume is incompetence. I tend not to put accents on words on this blog, partly to avoid looking incompetent, but more realistically because different web browsers render them in different ways so they often end up looking like a cartoon swearword rather than anything you were actually trying to say. Enough about the label. Despite being labelled a Reserva this wine comes with a screwtop, which still gives the impression you should be drinking it in the next year or so rather than laying it down for posterity. 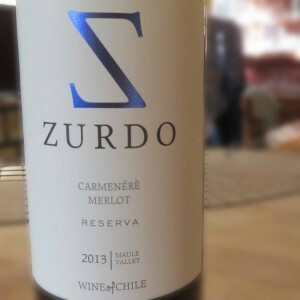 The Zurdo Carmenere Merlot Reserva from Virgin Wines is a bright fresh purple colour, with very little sign of age, not surprising really, it’s not very old (although the southern hemisphere does add six months). It smells jammy with lots of fruit. It’s dry, with a medium acidity, and some tannins which add to that dryness, making it a bit more drying. Whilst there’s some ripe tannins in there, and plenty of firm ones, there’s some green tannin too. It’s medium bodied, with the alcohol level just on the upper side of medium. The jammy fruit carries over into the flavour, along with something greener. It’s not the green pepper flavour that can sometimes be a bit disappointing in Chilean wines, but some thing more indistinctly herby, like it’s aiming for mint, but got distracted by basil. It’s not unpleasant, just unusual. The flavour doesn’t linger too long, it’s not a wine to savour. I don’t think it’s one to set aside to develop either. I’d put it in the drink soon category, but if you have some at home pour it out into a decanter a few hours before drinking to give it the best possible chance of shining. If you don’t have time, you can help it out with a little wine aerating gizmo which weirdly gets plenty of air into the wine and makes it taste like it’s just a little better than it is.